Food has been a big part of my life for as long as I can remember. My “journey” began as a youngster in the kitchen with my Mum. I remember helping to make sausage rolls for my Dad’s lunches and helping Mum mix the cakes, mainly so that I could lick the spoon. As a teenager my Brother and I were State level competitive swimmers. We trained about four hours a day at least 5 days per week so keeping our bodies fuelled became really important. My grandparents had a farming property close by so most of our food came from the land. My Mum used to spoil us for dinner by making the best steak and kidney pie or lightly fried lambs fry (liver) with onion gravy. Delicious! Ironically enough, in my later teenage years I announced to my family one day that I was strict vegetarian. This, combined with excessive sports activity, resulted in a dramatic (and unhealthy) weight loss and body obsession. This went on for too many years. I am pleased to say that with years under my belt and lines on my face has come some wisdom. For quite a while I have eaten a healthy diet and exercised regularly. However I still enjoyed a sneaky dessert every now and then quite often. One of my favourites was my Mum’s cheesecake. It’s really good. So you can imagine how disappointed I was when my lifestyle needed to change again (due to health reasons) and I began eating a Paleo diet. 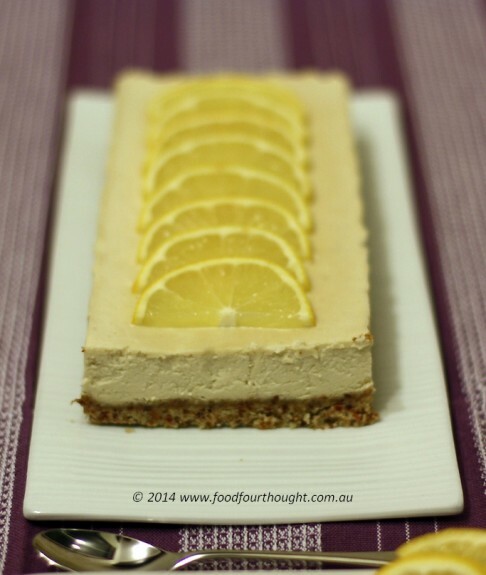 I just had to make some form of lemon cheesecake. Although completely different to my Mum’s recipe, I love it just as much :). I hope you enjoy this simple recipe too. 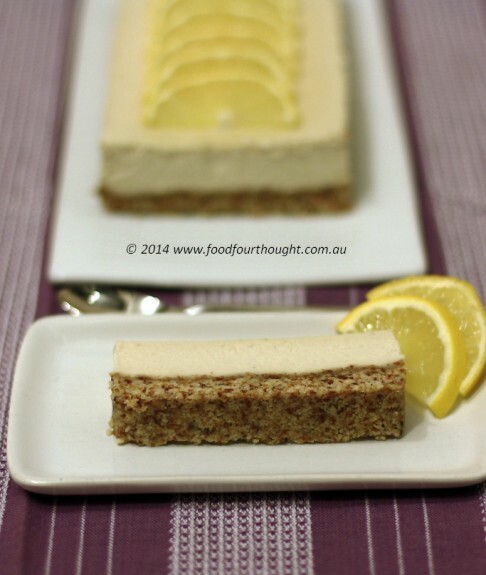 (paleo) lemon cheesecake – makes one loaf tin (recipe by Fiona at Food 4 Thought inspired by Paleo Cupboard). Line a large baking tray with non-stick paper or a silicone mat. For base, place almonds and dates into TM bowl and chop for 12 seconds on speed 8. Add coconut oil and mix for 20 seconds on speed 4 or until combined. Pour into prepared tray and press down firmly. Place in freezer while making the filling. For filling, place all ingredients into TM bowl and mix for 1 minute on speed 7 or until well combined and smooth. Scrape around the sides of the bowl and repeat if necessary. Pour filling over the top of the base and place into fridge for at least 2 hours. Serve with whipped coconut cream and lemon slices. My tips: *During winter coconut oil will solidify. The easiest way to melt it is to loosen the lid of the jar slightly then run the sides of the jar under hot water. It will melt quite quickly. *I activated the nuts by soaking them then roasting them in the oven. This process decreases levels of anti-nutrients such as phytic acid. You can find some more information here and lots of other places on the net. taste: 9/10 This was (it went pretty quickly) delicious. Even G, who is not a big coconut fan, loved this. It had a strong lemon tang to it and the filling was silky. The base had the right cheesecake crunch. Thank you so much for this recipe! I substituted the lemon for orange and added grated dark chocolate on top for friends dinner party and no one could believe how good it tasted and what it was made from – definitely going to be a regular dessert of mine! 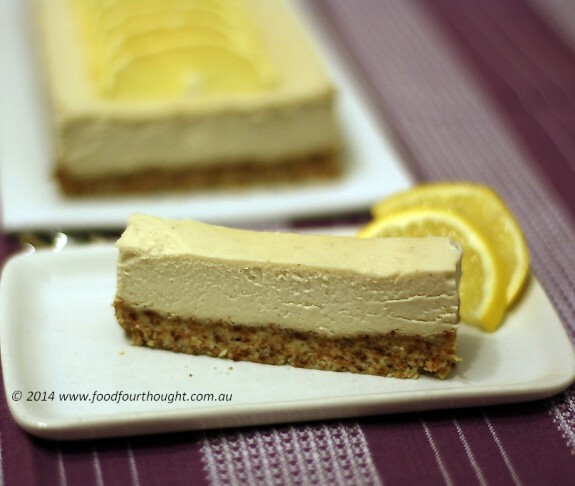 I have made another paleo cheesecake that is similar to this and was able to freeze it until required. Can this one freeze. May I ask if I should use fresh coconut milk or the box coconut milk? Am thinking of using freshly squeeze coconut milk. You could use either fresh or box coconut milk. I hope you enjoy it.